This is a Custom Level named the same as the 'Standard' Gruntziclez Stage 2 puzzle. The name is the same, but nothing else is, since the only Grunt you will have comes into the game with Brick laying Toolz . Everything is accomplished by "home improvement" (but not CHEATING) ... laying Brickz. Some 'special' Brickz are called for via Megaphonez , some of which are in plain sight, and some thingz are found in (Giant) Ice Crystalz ... uncovered by enemy Gruntz ... lured into helping out. The (rather obvious) SecretTeleporterTrigger will only get you the Warp Letter A , while the Question Mark Switch earnz prizez which show up on the completed Statz Page. On my own puzzle, I forgot to pick up four Coinz, so do not have a final Statz Page image ... yet. This morning (Sunday the 6th) I re-played it from the beginning (after adding another enemy Grunt, another Toy, and changing a Switch from Toggle to Hold type) and have captured a valid Statz Page image. So this puzzle is ready for a BETA tester ... with only the minimum EyeCandy objects ... the trees will only be added for the 'real' solverz ... the idea of BETA testing is to find flawz, and to ensure that everything workz ... not to test searching ability. I'm up to playing it, I've got some time today and tomorrow. SwordGrunt provided a successful BETA test result, so this is a "case closed" and will be slated for distribution on or about December 3, 2015. The link is not working (for me maybe). I doubt anyone will find it necessary to have, but I have completed an HTML walk-through for this Custom Level. Somewhere around December 10th (at least a week after release) I will upload it to the web host and link it in. Perhaps you would care to explain just how you did that? Understand, you only have to acquire a Tool/Toy to get credit for it, you do not have to ever use them. But in this puzzle, using the Toy makes the solution far easier for those with less than nimble fingers. Perhaps you would care to explain just how you did that? lure topmost kamikaze AI to bomb top left rock row --> "DEC 3"
lure middle kamikaze AI to bomb rocks on the right --> "15"
red pyramidz once again, bridge, warpstone, king. Understand, you only have to acquire a Tool/Toy to get credit for it, you do not have to ever use them. That severely collides with my minimalistic design ideaz: Coinz / letterz are for scoring only, toolz / toyz, powerupz are for solving only. But in this puzzle, using the Toy makes the solution far easier for those with less than nimble fingers. I found a few things that need to be fixed regarding this level. 1. Link which should lead to this thread from Alphabetical Order B is broken (2609 instead of 2701). 2. 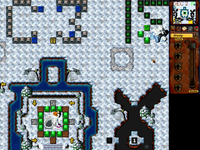 The viewable map has the entire left part of the image replaced with empty tiles, for whatever reason. Now a little about the level. As Perfect Grunt mentioned, you don't need to use the toys and the whole south-eastern part can be done in 2 ways. That part seemed quite confusing, I was expecting that I made a mistake somewhere but that wasn't the case. 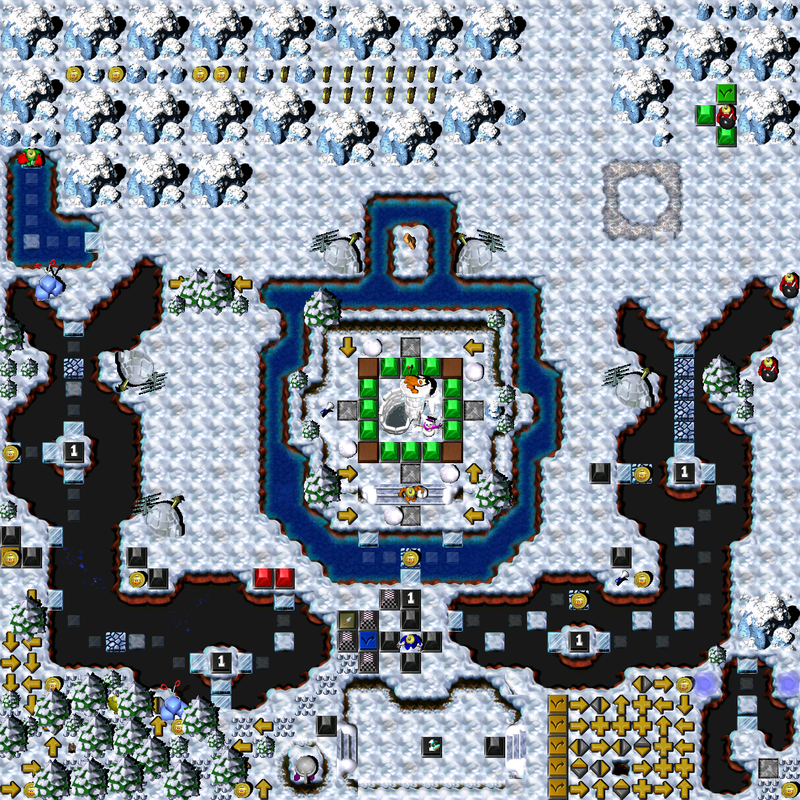 Igloos and trees are missing collisions behind them, while I think they should be present (at least that's what I usually see in other's levels). I don't want to be harsh, but there is room for improvement in this map (literally and coincidentally, the level has a lot of free space). 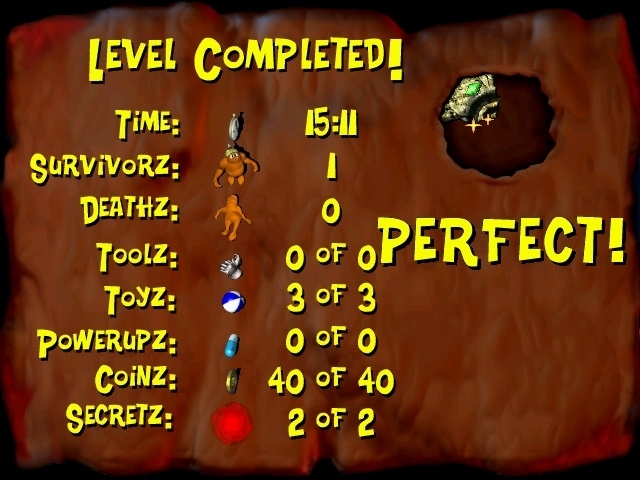 I have got a perfect score but I had to cheat in order to finish the level because I encountered a weird (but interesting) glitch with the Green Pyramids which prevented level completion. I'm going to address it in a separate post, because this one is already getting pretty long. So, the problem was that when I stepped on a Green Switch next to the King's Fortress, the pyramids didn't toggle. Just nothing happened, like the switch didn't exist at all. All other switches functioned correctly, only this one was broken. I tried stepping on it several times, loading saves and such. Nothing worked at first but I found the solution a while later. There was one more thing wrong with that "15": only the pyramids that were initially hidden in Giant Rocks worked. The two that you can see in the toggled state were totally unresponsive. I looked into the Gruntz Level Editor but all logics appear to be fine. As long as these two weren't working, neither were the pyramids around the King's Fortress. The solution to this was to destroy the remaining Giant Rock. Then all green pyramids magically started working again.